In the Midnight Jungle is an exhibition of light and sculpture, inspired by Sarah Spence’s love of the New Zealand natural environment. Sarah uses flax, nikau palms, supplejack vine, hemp and lighting. She creates a range of organic art works that are both decorative and functional. Sarah’s works comprise of weavings, sculptured lamps, vases, large woven chairs and furniture. Sarah was raised in Gisborne surrounded by the ocean and the great outdoors. She has been creating art ever since she was a young girl. Her love of nature and the outdoors has inspired the art she creates. 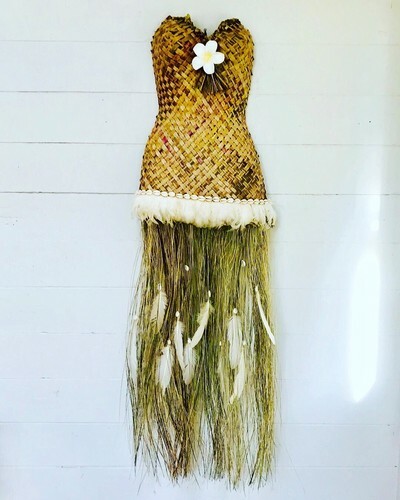 She later learnt weaving while up the East Coast of Gisborne with Puni McIlroy at Waipiro Bay. Since then Sarah has been creating her own woven bodices and wearable art along with huge hanging chairs from our native supplejack vine. Which have won a National Woman’s art award. Her art works are both decorative and functional, aiming to bring nature indoors, she uses the natural contours of her works and plays with light and its many dynamic features to create some very interesting moods and atmospheres with each distinctive piece. Her work breathes new life into subjects that may have never been seen nor appreciated in any light, for they would be lost to the forest floor. Sarah has taken part in collaborative exhibitions, as well as individual ones, and sells her works in galleries all over New Zealand. Since being in Napier she works from her own studio on Bluff Hill. She has formed her own art label Sarart.Co for her art and landscaping works. Join Sarah Spence to celebrate her opening on Friday 22 March, 5-7pm. All welcome!